I’ve got Pumpkin Cider Doughnuts from Geoffrey Zakarian’s new cookbook “My Perfect Pantry” on the blog today! I was able to get a beautiful signed copy at the Kohler Food and Wine Experience a few weeks ago. I had the pleasure of attending the food event in Kohler, Wisconsin. Ok, let me start by saying that this “experience” was first class from top to bottom, and I can’t wait to attend again. We stayed at The American Club in Kohler, and this hotel was top notch. From the moment my mom and I arrived, our every little need was taken care of. Our first night, we met up from my friend Alice and had dinner at The Immigrant Restaurant. This meal was one of the best I have had in a while. The next morning, my mother and I were treated to excellent spa treatments at The Kohler Waters Spa. I had a 90 minute detox massage that was absolutely heavenly. I fell asleep midway through the treatment. That should tell you how relaxed I was. 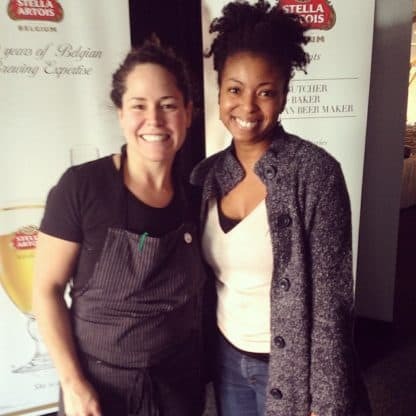 and with Chicago’s Top Chef Stephanie Izard. From excellent wine tastings to the top chefs in the country, the Kohler Food and Wine Experience is a festival that should not be missed. I loved how they feature the best of the best in the food world yet the atmosphere was totally relaxed and comfortable. The people who attended were some of the kindest people you would meet. I seriously cannot wait for next year. Once I got home, I couldn’t wait to try one of my many new cookbook recipes. I settled on trying the Apple Cider Doughnuts in Chef Zakarian’s cookbook because they were truly calling my name. I simply replaced the apple cider with a delicious pumpkin cider but followed the recipe as is. These doughnuts are simply fantastic! They are not yeast doughnuts, which I loved. It made the recipe less intimidating but the flavor wasn’t lacking for a thing. These doughnuts fry up golden brown and puffed to perfection. The glaze is one lovely component that brings the entire treat together. I double dipped each doughnut to get a thick coating of icing on each one. I warmed one and had it for breakfast each day for the last four days (crazy right?). I just loved these, and I look forward to trying more recipes from his book and the other chef books I received!! 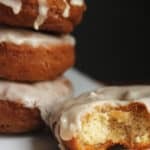 Delicious fried pumpkin cider doughnuts. Bring the cider to a boil in a small saucepan and reduce to 1/2 cup. 3 to 4 minutes. Let cool. In a liquid measuring cup, combine the milk and vinegar. Let sit 5 minutes to curdle into buttermilk, and stir. Sift together the flour, baking powder, baking soda, cinnamon, salt and nutmeg. In the bowl of an electric mixer fitted with the paddle attachment, cream the sugar and shortening together on high speed for 1 minute. Reduce the speed to medium and add the eggs, 1 at a time, until incorporated, then mix in the vanilla. Add the buttermilk and cooled cider and mix until combined. Add the sifted flour mixture and mix on low just until a dough comes together. Chill the dough 30 minutes in the refrigerator. When ready to fry, heat 2 inches of oil in a deep pot to 365 degrees. Roll half the dough on a floured work surface to about 3/4 inch thickness. Cut as many doughnuts as you can with a 3 1/2 to 4 inch cutter. Use a 1 inch cutter, or slightly smaller to make the doughnut holes. You should get 6 or 7 doughnuts from each half of the dough. Chill the first half of the doughnuts in the refrigerator while you roll out the second half. In a small bowl, whisk together the confectioners' sugar, vinegar, vanilla, and 1 tablespoon water to make a thick glaze. You should be able to drizzle the glaze from a spoon. If its too thick add a little more water. Fry the doughnuts in 2 batches until dark golden brown, about 2 minutes per side (a little less for the doughnut holes). Drain on paper towels and bring the oil back to 365 before frying the second batch. While the doughnuts are still warm, dip the surface of one side in the glaze. Let the glaze set with the glazed side up on a cooling rack for 5 to 10 minutes. These doughnuts are best served warm or at least within 1 to 2 hours of frying. 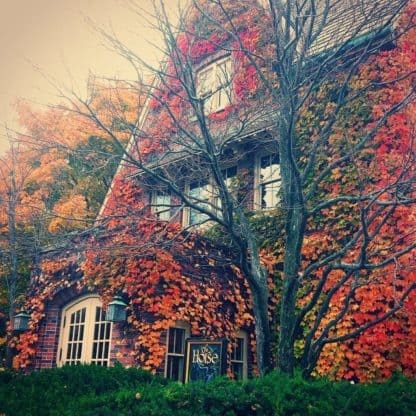 Looks like you had an amazing time at the Kohler F+W Experience!! Isn’t Geoffrey Zakarian the best?! My wife is so in love with him… it’s her silver fox crush. And these doughnuts… I’m so drooling over them right now! Wow, what a great experience. 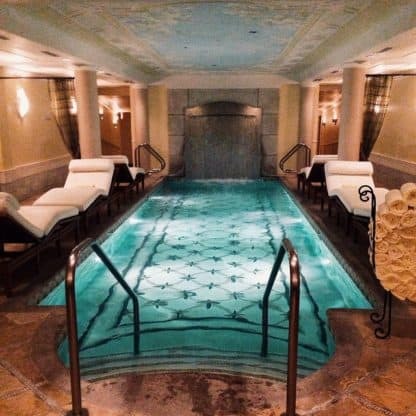 I can’t get over that spa–gorgeous! I’m going to need all of these donuts…because, donuts! Pinned. Looks like you had a great time! These donuts sound amazing! Holy nom nom. Cider donuts are my favorite! Especially when there is pumpkin in the mix! Wow Zacharian is very heavily styled these days huh? This looks like it was an amazing retreat for mom and daughter. Wish they had stuff like this in the Middle East! What a fabulous treat this trip must have been! And these donuts- swoon! What a fun experience, Jocelyn. I’m glad you had a fun time there. 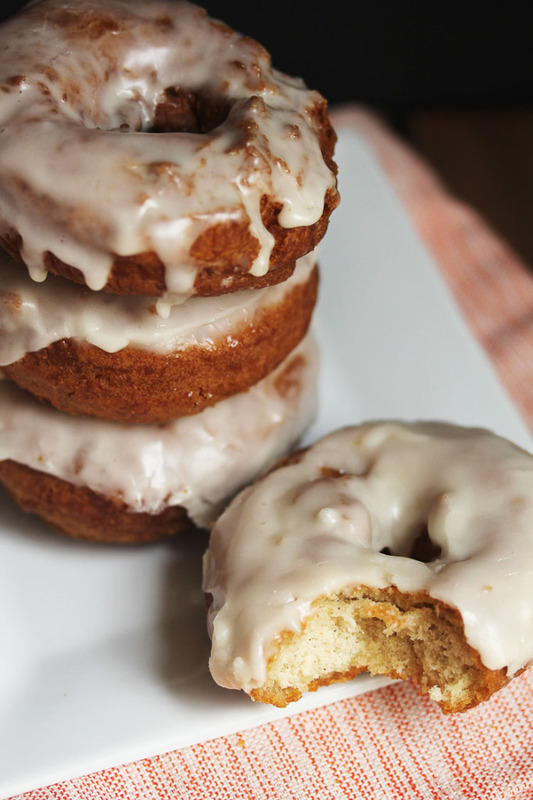 And those donuts…I totally adore pumpkin cider doughnuts. They are seriously the best things ever! I love donuts, but did not eat pumpkin ever. More than likely they are very tasty. on weekends I cook them myself, I hope I get it right. 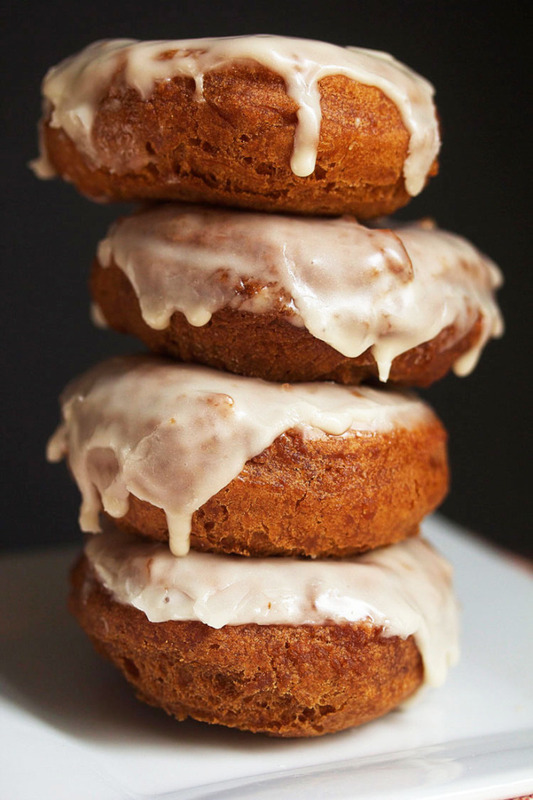 And these Pumpkin Cider Doughnuts… they look and sound DIVINE! Yum! The doughnuts look beautiful and that icing dripping off is calling my name. It sounds like you had a great time at the festival. 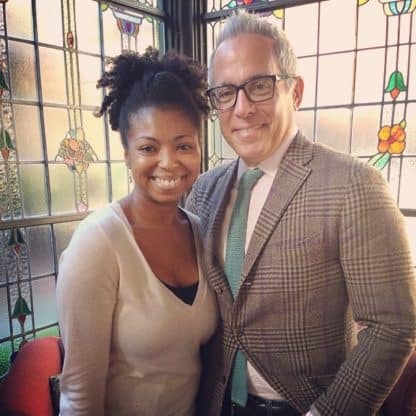 What a fun experience, Jocelyn, and meeting Geoffrey Zakarian must’ve been a thrill! Love the sound of these donuts! It was such a thrill! He is awesome! Hooray thanks so much Heather! Oh I am drooling!! This looks just amazing! Hooray thanks so much Annie! I loved doing Kohler with you, boo. . and your mother. . I see now where you get your charm and personality! 🙂 hope we can do it again next year! 🙂 love these doughnuts!!! Aww thanks boo. We had a blast with you! Can’t wait for next year girlfriend. This recipe… is totally making me crave donuts. GORGEOUS!!! 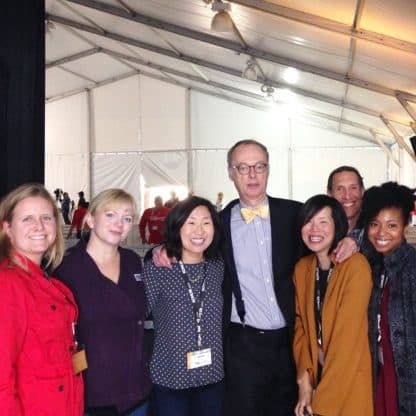 Also… meeting Geoffrey and the test kitchen crew? JEALOUS! That sounds amazing!! It was totally cool. And I am having a serious donut craving situation this week because of these! Sounds like you had a great time…these donuts look perfectly golden and delicious! Love them! I had an awesome time! These donuts were perfection! All I need is one of these pumpkin donuts and a dip in that water spa. It’s all I need! Same here. I would be very happy with both of those things! These donuts look incredible and your trip sounds amazing! So jealous! The trip was so amazing. You should definitely check it out next year. 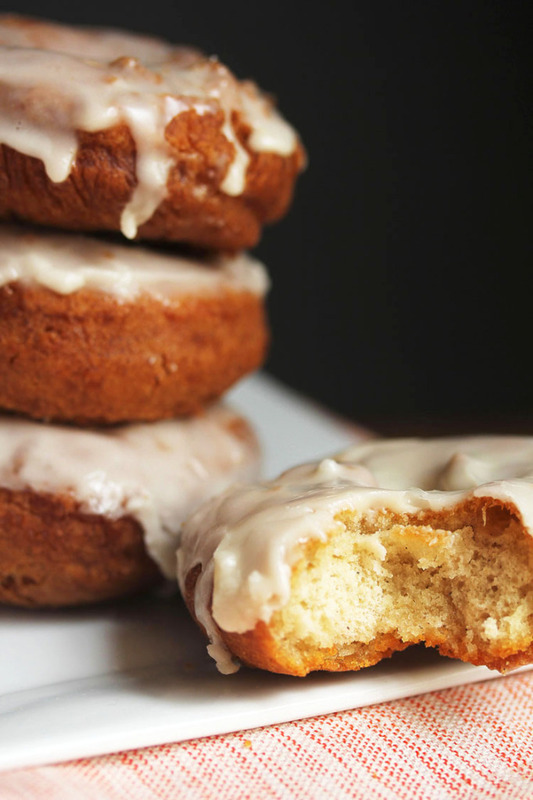 Nothing says fall like these pumpkin cider doughnuts. I so wish it was fall here in Chile. Maybe if I make these I can pretend that it is. I can almost smell them now. They look so yummy! Oh the smell of these doughnuts is so heavenly. Almost intoxicating. -fan girl scream at Geoffrey-! Double glazed! Yum these look so decadently delicious! Stephanie is the best! She is such a creative chef! Delicious!! I picked up some pumpkin cider at the store and now I know how I am going to use some of it. What a fun event! I am going to have to mark my calendar for this next year! Definitely attend next year, and also make these doughnuts asap! Wow! You met some awesome people! I am a sucker for donuts! I love this recipe. Definitely pinning! Love any type of doughnut, but good-golly these look like the holey grail. They are totally up there in that running my friend. Doughnuts are my weakness! Love everything about these! And what an amazing experience. It sounds like you had the best time! Fun! Doughnuts are my weakness too Ashley! These doughnuts just simply look amazing! I wish I could have a bite right now! Your trip looks like so much fun! I love Geoffrey Zakarian, and I still remember Stephanie when she was on Top Chef! Oh I had an awesome time and these doughnuts were the perfect recipe to try.